A new month means a new featured paper collection, and for October, Sangria is the belle of the ball! We love this vibrant paper collection, especially for creating fall layouts. The rich, warm tones capture the colors of the landscape preparing for winter. It has so much warmth! The quilt pattern on the right page even makes you what to wrap yourself up in a giant quilt and sip some warm cocoa from your favorite mug. This layout uses all three elements to enhance Sangria and produce fantastic fall artwork. Let’s dive in! 1. Gold. And more gold! Anything gold pairs wonderfully with Sangria. Try your hand at some Picture My Life™ gold overlays. Our artist used them to liven up squares of cardstock in the quilt pattern. See the polka dots and the “life is GOOD” sentiment? You’ve got it—overlays! The “ADVENTURE” sticker with gold lettering is from our Fundamentals stickers Basics pack, and, of course, we’ve got some gold sequins in the mix, too. All these gold bits add warmth to this fall layout. These exclusive colors work hand in hand with the Sangria color palette. 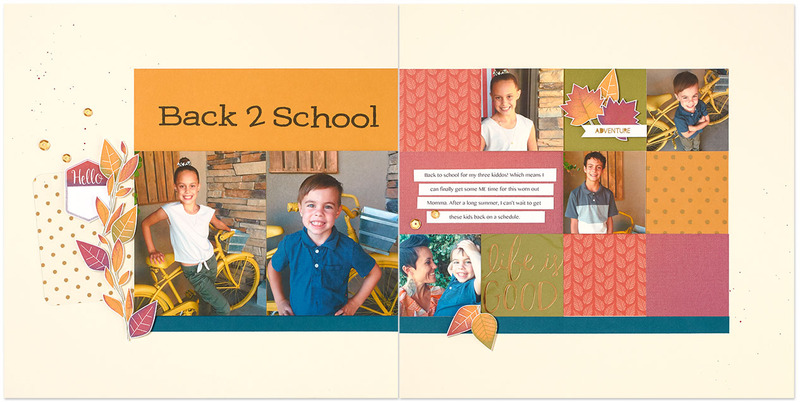 On this layout, you can see how well these cardstocks pair with the Poppy and Pomegranate colored B&T Duos™. You can also see Saffron and Fern ink in the leaf stamps. Ready to rock n’ roll at home? First, stamp the leaf image in the lighter color. Then clean your stamp, and place the edge of the stamp on the darker stamp pad. Roll the stamp around so ink only gets on the outer edge of the stamp. Then stamp over the first image, and there you have it! For a visual how-to, check out our rock n’ roll Instagram video! As you may have noticed, not all of the leaves have the darker ink all the way around the perimeter. You can certainly ink just one edge of the stamp—get creative! It’s a lot of fun, and there are a lot of looks you can discover! Now you have three great tips for creating warm, fall-themed artwork using our Sangria paper collection. Show us what YOU can do with Sangria by typing #ctmhsangria in your post when you share your artwork on Facebook, Instagram, and Pinterest. We want to see your creativity at work! Sangria was my favorite paper pack in the Annual catalog…such gorgeous colors and so versatile. I even saw a posting where it was used on a Christmas card. The Rock and Roll stamping technique is awesome!